Loading railway sleepers onto train wagons was undertaken using a 25 ton crane and grab at CEMEX UK’s Washwood Heath plant. Operators were required to stand at each end of the wagon to guide the crane and ensure the stacked sleepers were correctly lowered into position. The operators had to stand on the buffers due to restricted length of the of the wagon bed. This exposed them to potential risk of slips, trips and falls, particularly as the loading is undertaken at all times of the day and night and during all weathers. A fall could result in a four foot drop onto the railway line or part of the wagon. To overcome this issue, a standing platform was designed. Once the train is shunted into position, a winch is used to lower a raised platform down to a horizontal position over both ends of the wagon. 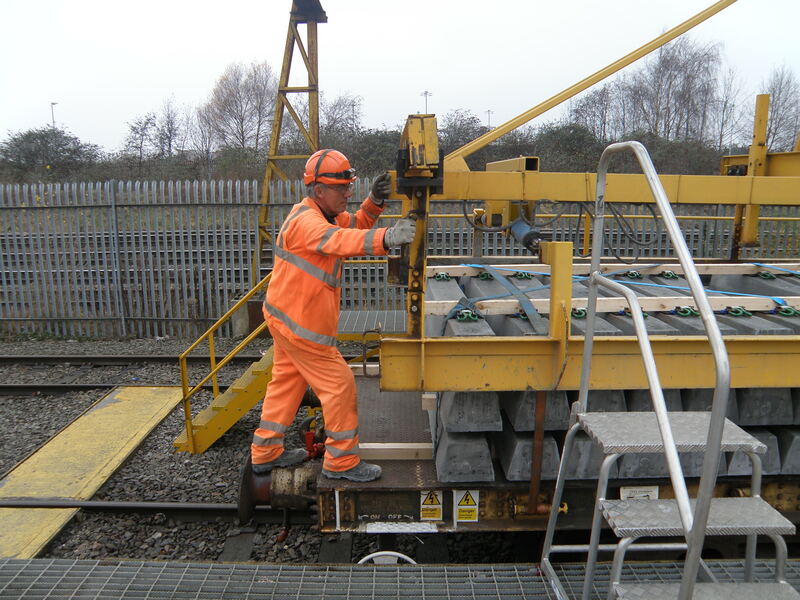 The operators can stand on the platform and safely manoeuvre the crane and sleepers into position, it also enables the operators to cross the wagons to the other side of the train. Improved morale and engagement as all yard operatives were involved in its design.